It was a day before her 89th birthday, but the mood in that sunlit and simple hut where we met her was far from festive. There were only faint conversations in the vernacular T'boli being translated to us by her granddaughters because she could not speak Tagalog. Sitting comfortably in that old rattan chair, she looked every inch a master. Donned in a beautiful T'boli costume, which is by the way her usual attire with or without visitors, I felt very honored to be in the presence of this amazing woman, the legendary dream weaver, Lang Dulay. A recipient of Gawad sa Manlilikha sa Bayan Award and declared a National Living Treasure by the National Commission for Culture and the Arts (NCCA) in 1998, Lang Dulay was recognized for her excellent craftsmanship in weaving the prized T'nalak or the traditional T'boli cloth. 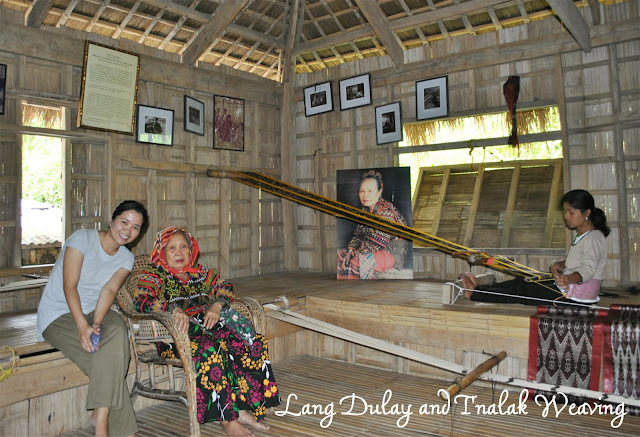 Lang Dulay at the "office"
She is the master weaver who's keen at guarding and passing down the craft to the future generation of the T'boli people. She established the School of Living Traditions (SLT) close to her house in Sitio Tukolefa, Lamdalag, Lake Sebu in South Cotabato. Her students are mostly her granddaughters and relatives. 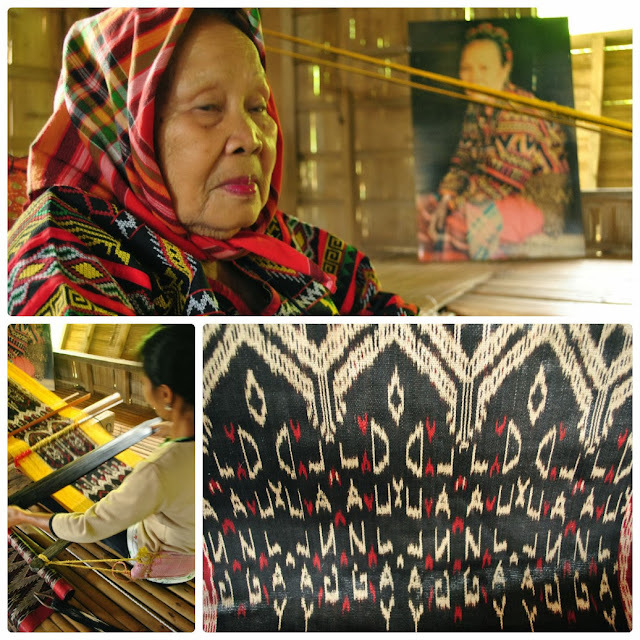 Although most of the geometrical patterns have been derived from Lang Dulay's own dreams, thus literally called a dream weaver, equally intricate and impressive designs are also being produced by her students. Learning the trick of the trade from her mother since she was 12 years old, Lang Dulay had to stop weaving these days due to health issues. However, her daily presence in the weaving center to assist the students with the design and production of T'nalak is a statement that she wants to continue the sacred tradition to her lineage. In that small hut standing on a stilt about 6 feet high, the students are taught the long and arduous process of producing a T'nalak cloth. Devoid of chairs and blackboards often seen in a regular classroom setting, students are seen seated on the floor, in their own nook engaged in their works, trying to master the age-old art of weaving. A single finely woven T'nalak, 3 to 5 meters long takes about 3-4 months to make. The long process starts with stripping off fibers from abaca trees. These fibers are kneaded, dried, combed, measured, and cut before the actual weaving is done. The colors are achieved by dying the abaca fibers using roots from Loko tree (red dye) and leaves from Kanalum tree (black dye). The finishing touches, which they call "ironing", are done by repeatedly pounding and rolling a big shell on the cloth. This I think is the secret to its very fine texture. 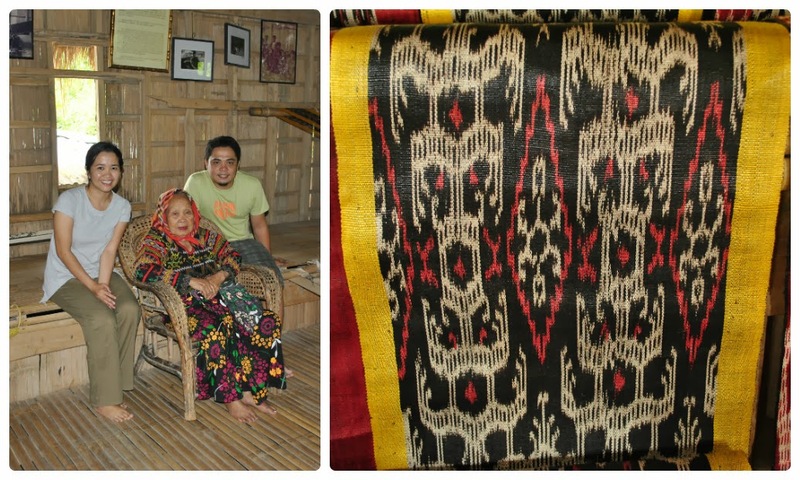 Knowing how much work was put on in making the cloth, I didn't mind paying P1,500 for a 3-meter T'nalak which is now one of my favorite souvenirs from a trip. Authentic, exquisite, and with the traditional mark of a national artist, I even think that taking it home is quite a steal! The T'boli tribe has had a long history of weaving and textile work. They've had it for ages and there is an inevitable pressure especially among the T'boli youth to continue the tradition going. 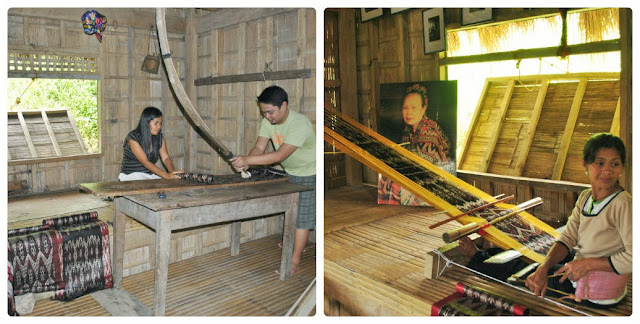 At present, there are a number of weavers like Lang Dulay in the tribe and the methods they employ remain unchanged in centuries. The skills and unique rendition of patterns are handed down within each family. As Anchi and I bade goodbye to Lang Dulay and her students, I was gripped with hope that the tradition of making T'nalak will live on forever. In this modern age where everything is manufactured easily, the idea of still putting too much effort making a single cloth is beyond me. Ultimately, I find it heartwarming that in that native T'boli hut in Lake Sebu, the fibers are woven with love and dedication. And that to me is priceless. Wow, ang creative niya. Mukhang unique pa ang mga designs niya. Amazing! Another highlight is the 7 waterfalls. :-P Zipline adventure! Very well written. You showed your appreciation to our Lang Dulay. Please write more about Mindanao. Hihintayin ko yan. Visit Sarangani din. 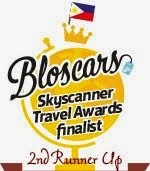 Yun naman ang Boracay of Mindanao. Have a safe trip always. So envious of you, Che! I wanted to see Lang Dulay. I hope to go back to Lake Sebu next year. Hi Ciel! Lang Dulay and her students are very accommodating. Don't miss them on your next visit to Lake Sebu! Miss you! hi! will be in lake sebu on the 30th. may i ask how to go to lang dulay from the zipline? also, how much is lang dulay selling her textile? the one with her mark? many thanks!!! Hi newbie! The most common mode of transportation around Lake Sebu is by habal-habal (motorcycle). You may rent one for P250-300/habal-habal inclusive of visit to Lang Dulay and 7 Waterfalls Zipline.